This is a totally random story, but there isn't much else to report so here it goes. Chris works in the main state government office in Las Vegas. I didn't think IT work was a dangerous position, but last week every one in the building was evacuated because of a suspicious package. There was police, bomb squad the works. They had everyone walk down the street to a field to wait it out on the bleachers. This all started about 2 p.m. and after a couple of hours they told everyone they could go home, but they weren't allowed to go back in the parking lot so Chris couldn't get his car to come home. This might be annoying to some people, but Chris was excited by the prospect of taking the bus. (I know he's a little off sometimes). He figured out the route and which bus he needed to take, but when he got on he couldn't find his money and he got the boot. Lucky for him there were some rule breakers who got their cars out of the parking lot, one of which was his friend, so he was able to get a ride home. He was so bummed that he didn't actually get to ride the bus, that he decided to take it home the next day. It was all fun and games until the next morning when he had to leave the house at 6:40 a.m. to be at the bus stop on time. I know there are many of you who get up much earlier than that, but around here we really aren't morning people. I think he got it out of his system for a while because as entertaining as he thinks the homeless and drug addict passengers are they aren't worth a 6 a.m. wake up call. Today is my dad's 60 60th birthday (family joke)! Happy birthday dad and grandpa, we love you! My brother Brandon and his wife Cara were visiting from Idaho so we filled the long weekend with as much as we possibly handle. Here's the weekend wrap up. 7 p.m.: We had a family birthday party for all of our February birthdays my dad, Ashton(8), Scott(3) and Lacey(2). 8:00 p.m.: We followed that up with my favorite family tradition, decorating valentine cakes. We usually do this on the Monday before Valentines day, but Brandon didn't want to miss out so we waited for him. Of course I didn't have my camera, but I borrowed the picture and the stats from my sister-in-law's blog. We were trying to figure out how long this tradition has been around and we decided at least 24 years. This year there was 32 cakes decorated. We might have to start using the church gym to fit our ever expanding family. 10 a.m.: Ashton had her friend birthday party at Chuck E. Cheese. The kids cousin's are really their best friends, but in an attempt to be a little less over protective and a little more social they get to invite school and church friends to their 8th birthday. As an incentive for booking our party at 10 am all of our guests got twice as many tokens and the building wasn't as busy as usual. It was fantastic not to worry about entertainment, goodie bags, food and clean up. All I brought was the cake. Everyone had fun, and with so many tokens everyone got their fair share of prizes. 9 a.m.: Aaron blessed his twin girls Erica and Elizabeth. 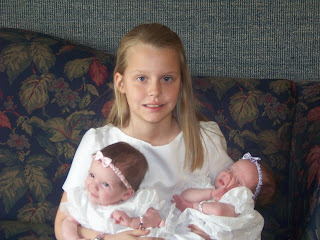 Ashton wanted to wear her baptism dress, so we got a picture of all the pretty girls in their withe dresses. Elizabeth has the pink headband and Erica is in the purple. 4 p.m.: Chris's mom is in town for a few weeks so we hosted a dinner with his family that could make it. Not a big deal for some people, but I'm lucky enough to live close to alot of family and my parents open their home for Sunday dinner to all of their kids every week. I know I'm spoiled. 6 p.m.: Ashton's baptism. We really appreciated everyone who was able to make it, but don't feel bad if you didn't hear about it. I'm not good at remembering to invite people to things and we had to get special permission to even do it on a different day than the stake baptism so we weren't really broadcasting the event. We do, however, really appreciate everyone who came. It was really special and we are so proud of Ashton and her decision to be baptized. Some people might think that an eight year old child is to young to make that big of a choice by themselves, but Ashton and (and Kaylee for that matter) decided on her own that she wanted to be baptized. 7 p.m.: My brother Austin had a court of honor and recieved his Eagle Scout award. This makes seven for seven for my parents. All seven of their boys are Eagle Scouts now and I know it was a lot of work on their part as well. My dad wanted all of the boys to wear a scout shirt. Chris didn't do a lot of scouting when he was a kid, but he wanted to look accomplished so he borrowed a sash full of merit badges from a 14 year old kid in our ward. Needless to say it was a little snug. 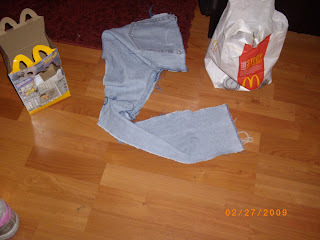 12:00 a.m.: About 20 minutes before we left for the baptism, Dalin dropped a heavy wooden box on his bare toe. I gave him some Motrin and luckily he was tired he slept long enough for the medicine to kick in so he was pleasant for the baptism. By about 11,l even with medicine his toe hurt so much he was inconsolable. He could bend his toe so I didn't think it was broken, but I did think it needed to be drained. I definitely did not want to be the one to do it so our option was the emergency room. By the time we got there he was acting fine (of course!) but we stuck it out. I was right on both counts and the doctor put a little hole in his toenail to relieve the pressure so although his toe still hurts, he is much better. Before we went to the hospital we had turned on Toy Story 2 to try and distract him, so when we left he was upset that the movie wasn't over. I told him he could finish watching it when we came home fully expecting him to be asleep therefore forgetting all about it. We got home about 2:45 a.m. and he was asleep, but he woke up when I got him out of the car and he remembered the movie so I let him watch it. Chris was nice enough to take over and let me go to bed. I found out the next morning that not only did Dalin stay wake for the rest of the movie, but he wanted to watch The Incredibles so Chris started that one for him. 9:00 a.m. (I know, still not done? ): We had a breakfast to celebrate my dad's birthday. After breakfast my mom and all of the kids shared their favorite memories of my dad. I think one of my dad's favorite things is to be surrounded by his posterity so it was just what he wanted. It was a great weekend filled with family, friends and special occasions. I know I never post anything, but I had to share this cool video I saw today. * The video was shot all stills - roughly 3225 still photos for the entire video, using one camera, hanging from the ceiling for the main body of the movie. * It took 4 weeks before shooting to create an animated computer generated storyboard for the video, with 3d dummies for the characters. * It took only 2 days of shooting for the live actors on set to re-create the 3.5 minutes computer sequence, frame by frame. That means Toy Story 2 for those of you who don't know German. How do I know? 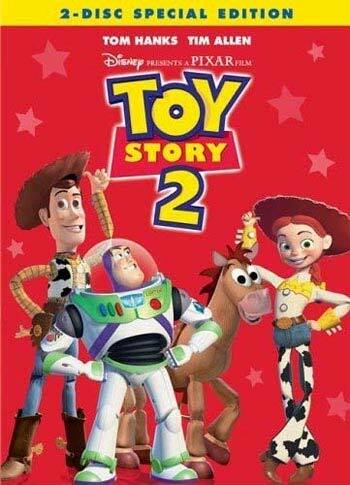 Well I looked it up, but we recently came into a version of Toy Story 2 that is completely in German (don't ask). The funny part is that Dalin doesn't care. The other day he watched it three times and threw a huge fit when I wouldn't turn it on for a fourth time. Crazy little two-year-olds, their always good for a laugh. There has been a "Monster Bus" (a bus on monster truck wheels) making the rounds in town the last couple of months offering rides for $5. The bus's most recent location is at the Lowes by our house and when we drove by Dalin really wanted a ride. I told him it cost too much money so we weren't going to ride. I then had the following conversation with Aiden. A: "It's only five dollars Mom." Me: "Do you have $5 you want to spend on the Monster Bus ride, I don't. Besides you'd have to pay for Dalin too." A: "That's still only $10." Me: "Well you two wouldn't be allowed to go by yourselves so you would have to pay for me too." A: "That's $15!" (He's kind of a math whiz.) "Maybe if I just held Dalin's hand they would let us go by ourselves." Me: "No I'm pretty sure an adult has to go with you." A: (After a thoughtful pause) "How do you get money out of your college fund?" Luckily he has a mom to save him from himself so fifteen years from now he's not working at McDonalds lamenting the fact that he didn't go to college. "If only I hadn't spent that $15 from my college fund when I was six..."
WARNING! 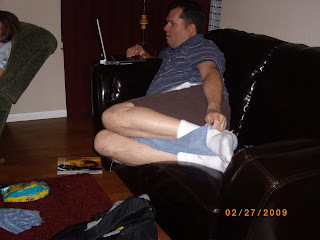 The following pictures gross my husband out! Proceed with caution!! 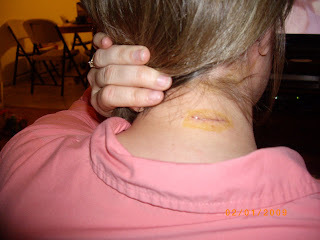 About five years ago I noticed there was a lump on the back of my neck, so I went to the doctor to get it checked out. He told me because it was soft and not painful it was probably just a fat pocket. It has a technical name, but I can't remember what that is. I do however say it to the tune of the hot pocket commercial which is hard to explain in writing if you haven't seen the commercials. I digress. 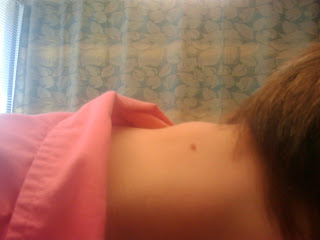 I won't say I really forgot about the lump, but I didn't think much of it until about the last year. I thought it may have gotten a little bigger so in November I went to the doctor again. He told me the same thing as the five years ago doctor, but he told me I could get it removed and he would also remove a mole that I have always had while he was at it. Bonus for me because Chris has been threatening to cut that mole off with the fingernail clippers since we first got married. Well today was surgery day. Chris kept asking me if I was nervous, but I was actually excited because with the anesthesia I would get, I would have an excuse to sleep all day and feel no guilt. Everything went really well, but I only got to sleep for about 2 1/2 hours before the kids found me (by kids I mean Dalin). Luckily there is very little pain, I feel completely normal and although they sent the tissue out for testing the consensus is that it is indeed just a fat pocket. Here are the before and after pictures which really aren't very gross, Chris is just a wimp. It looks like a pretty long incision, but it's only about an inch I don't know what the extra is. The doctor used Dermabond so I don't even have to have a bandage to worry about keeping dry.